In gardening terms, transplanting involves taking plants from the seed raising beds to the main garden. Transplanting can be a time of stress for the plant and often growth is temporarily checked. Using good transplanting methods can minimize this. Seedlings are fairly resilient and while they need to be kept growing forward it is not crucial in most cases that seedlings be transplanted at any exact time of their development. As long as seedlings have enough moisture, nutrients and root space, a week or two either side of their best transplanting size will not affect their final performance to any great degree giving gardeners some flexibility when planting time comes. 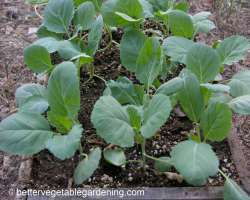 Vegetable are grouped into plant types, they are either warm or cool season vegetables To help decide the correct time and conditions for doing this, follow this link for the bettervegetablegardening.com planting guides. Some seedlings will be showing signs of flowering, even at this early stage. In most cases it is best to remove these to allow the plant time to grow before using valuable energy to produce its desired crop. When your seedlings have been well hardened and showing no signs of wilt or stress they are ready for transplanting to the garden. To help make the adjustment from pots to the main garden as stress free as possible, plan for transplanting seedlings either in the late afternoon or on a cloudy day. The depth transplants are planted to will vary depending on the vegetable type. 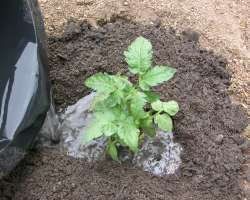 Many young transplants, like tomatoes, can benefit from being buried up to their first true leaves, while others should not be buried any deeper than they were in their pots. For more details go to the transplanting section of the vegetable concerned. Add a starter fertilizer to water when transplanting. Starter fertilizers are high in phosphorus which helps to promote root development and will give them the boost they often need in the early stages of adapting to their environment. Careful transplanting and care of the seedling will pay dividends in the end by seriously reducing, or even eliminating any transplanting stress. It's time to transplant your seedling, this is one of the really cool point of being a home gardener. Whether they are your own seedlings or purchased for an outside source it matters not. 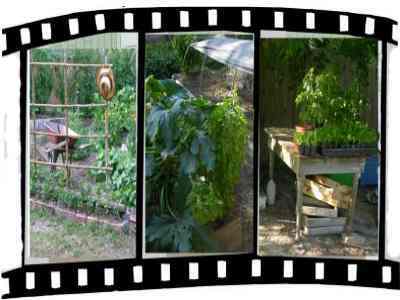 It's always exciting because before you know it you'll be harvesting and eating the vegetables you produced. As mentioned earlier, to help reduce transplanting stress, plan to plant seedlings either in the late afternoon or on a cloudy day. However if Mother Nature is uncooperative in providing cloud cover at the time of transplanting seedlings you may have to get creative to provide the necessary shade. 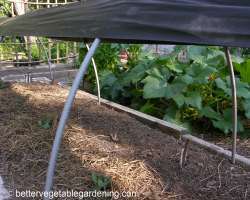 This can be as simple as covering the seedlings with mulch or something similar. Or a slightly more elaborate but still temporary structure giving shade to a larger area . Shade is especially important when transplanting in mid-summer for the winter garden. 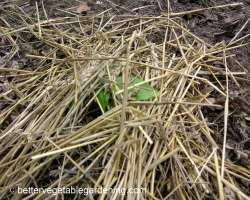 The last step of mulching around your seedlings is a very important stage in transplanting. It will seriously reduce water loss and discourage weed growth. Follow this link for the lowdown on garden mulch. Mulch can be any organic matter you have available that will do the job, leaves, straw and pine needles are three easy to obtainable mulches in most areas. One final step that can be taken when planting seedlings is to protect them from cutworm and other crawling pests by providing the seedlings with a protective collar.